A friend of mine, on finding out that I’m friends with Matthew Paul Turner, asked me a rather pointed question one day. I guess I can understand why that might be a first impression, but let me tell you this: I’ve gotten to know Matthew pretty well over the last few years and “cynical” is the last word I would use to describe him. Matthew Paul Turner is one of the good souls in the world. I was going to Nashville and a friend of mine knew Matthew. I thought to myself, now there’s an interesting fellow. I’d like to have coffee with him. So I sent him an email. And he agreed to have coffee with a total stranger. We hit it off, spent a few hours getting to know one another, and have stayed in touch ever since. It’s something I haven’t forgotten, that an author like him, with multiple books under his belt and a large platform, would take the time to meet with a complete unknown like me. I called him and he asked me some questions and told me to hold tight. Within a few weeks I was scheduled to go to Sri Lanka with him and a World Vision team of bloggers. Within six weeks I was on the plane, layover in JFK, layover in Dubai, landing in Colombo. It would turn out to be a turning point in my life. But one of the things I remember the most about the trip is Matthew taking pictures, always wearing his fedora hat cockeyed on his head. You could tell he loved the Sri Lankan people, and he tried everything and anything to get the right photo, because he truly believed that the difference between a child sponsorship and no child sponsorship could be the quality of the photos he took. I’d come around the corner and he’d be laying in the dirt, aiming his camera into a particular filter of light. I’d look around later and he’d be spread out on the floor of a hut, getting the little children to laugh. Cynical? No, not Matthew. Loving. Sincere. Desperate to find good somewhere, even in the darkest places. Matthew can be highly critical of the church – sometimes it stings, because it hits so close to home. But I think Matthew is critical, not because he wants to bring the church down, but because he wants to, in the end, see it built back up again. I really believe this. Beneath the sarcasm and the sometimes biting humor is someone who loves Jesus, who hurts for those who have been hurt by the church, and who wants to see people find peace and grace. Enter his new book, releasing today, Our Great Big American God. Whip-smart and provocative, Turner explores the United States’ vast influence on God, told through an amazing true history of faith, politics, and evangelical pyrotechnics. From Puritans to Pentecostals, from progressives to mega-pastors, Turner examines how American history and ideals transformed our perception of God-for better and worse. 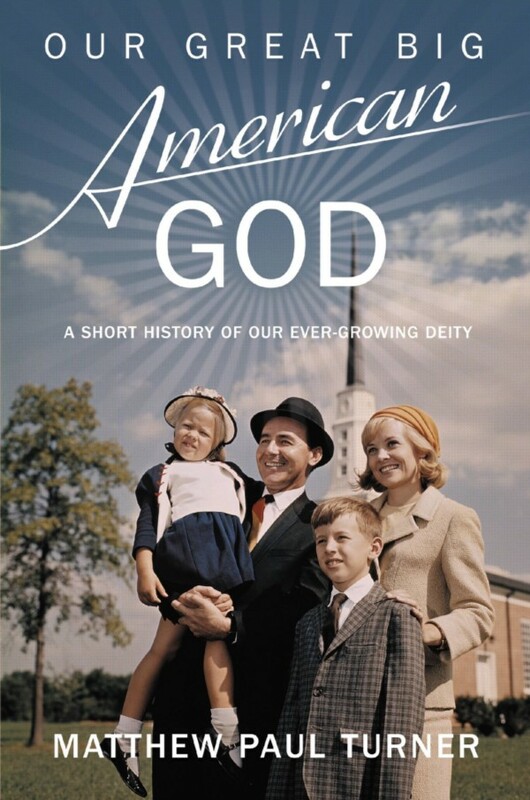 Fearless and funny, this is the definitive guide to the American experience of the Almighty-a story so bizarre and incredible that it could only be made in the U.S.A. Regardless of political affiliation, it will make readers reconsider the way they think about America as a “Christian nation,” and help them reimagine a better future for God and country. It’s a book that every Christian in America should read, because too many of us have turned God into an American, and Christianity into a nationalist movement. If you’re a conservative evangelical, this book will probably offend you. It will definitely make you uncomfortable. And that’s why you should read it. Thanks, Matthew, for writing the book that Christians in America need to read. Most nations were former city-states, and before that overgrown families, and each had their own deity. Abraham confederated a dozen tribes that each had insufficient military might to hold a territory, and combining their areas of knowledge, developed accounting. The Egyptians, building huge pyramids and other public works projects, hired the Hebrews to manage construction, and the Egyptians decided they had bought, not rented the Hebrews. Since the Hebrews had themselves no God, they hired one, making a covenant with Jehovah, In the story of the commandments, we find Him telling the Hebrew people, “I am the Lord,THY God”. Not the God of all mankind, but the God of Israel. I’m not sure why people think this country was founded by Christians, The founding fathers were mostly deists and masons, Good Christians obey civil authority, which meant the King, who was head of the church. They were Tories! That’s an awfully good question, and one a lot of pseudu-Christians won’t like the answer to. A good minister, they say, comforts the afflicted and afflicts the comfortable. Turner seems to be a good minister.